The pattern flipped on its head as temperatures soared above normal between the 10th and 13th. High pressure from the Great Lakes slid overhead and a Bermuda High established itself off the Atlantic Coast. The resulting southerly winds allowed sticky air to return as temperatures climbed well into the 90s. Many cities along the I-95 corridor broke high temperature records, such as Baltimore, MD, which hit 97 degrees on the 13th! However, another front not only brought temperatures back near normal, but also dropped up to 2”+ of rain in parts of Massachusetts. This was just before a warm front lifted through on the 17th and 18th, which helped produce heavy rain for New York City with nearly 1.5”. Otherwise, this front allowed highs to return into the 80s, though not as bad as the last warm spell. With that said, the humidity certainly made it feel uncomfortable (to say the least) once again. One of the region’s biggest severe weather outbreaks accompanied a potent cold front on the 19th. 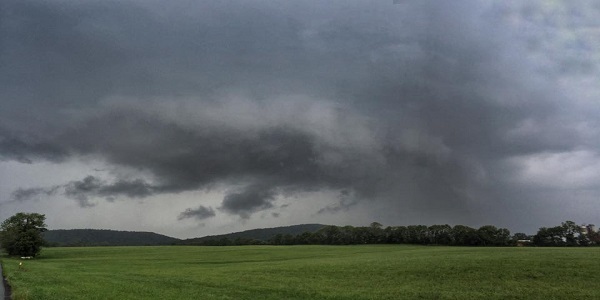 While the humid air was finally swept away, several squall lines during the afternoon led to many wind damage reports from Virginia to New Hampshire and even three tornadoes in the Mid-Atlantic. The Northeast remained slightly warmer than average for the following week, but wasn’t too active weather-wise. However, this didn’t last long as the remnants of Tropical Storm Cindy from the Gulf collided with a cold front in the Midwest, resulting in a small but powerful system that rolled into New Jersey on the morning of the 24th. This once again produced an area of damaging winds around southeastern PA and New Jersey, including two tornadoes in Howell, NJ! The remainder of the month was quiet thanks to a cooler air mass taking hold again. An upper level disturbance did bring a few storms to New England that led to several hail reports across the region. Temperatures also ran 5 to 10 degrees below normal, even triggering record lows on the 28th. Baltimore, MD hit a low of 51 degrees with many more spots across the Northeast also breaking records with temps in the 40s and 50s. Overall, June ended up 0.5 to 1.5 degrees above normal despite what felt like a cooler than usual start to summer. And even with that, it still was a rather active month that included several severe weather outbreaks. This led to variable rainfall totals across the region, with the most apparent deficits in Maryland and northern Virginia.